"Sampath Speaking" - the thoughts of an Insurer from Thiruvallikkeni: Hardik Pandya blitzkrieg ~ India wins ODI Series 4 - 1 .. !! Hardik Pandya blitzkrieg ~ India wins ODI Series 4 - 1 .. !! Madras’s Mount road was richly associated with theatres and one among them was Wellington, which reportedly opened in 1918 and stood at the junction of Mount road – General Patters Road. Miles away, Wellington is the capital city and second most populous urban area of New Zealand, located at the south-western tip of the North Island, between Cook Strait and the Rimutaka Range. The 5th One dayer was played here today .. and not often a team that is 4 down at 18, ends up winner !! Back home, at Nagpur on day 1 of Ranji Trophy 2018-19 Finals – Vidarbha crawled to 200/7 with Unadkat taking 2/26. The day perhaps belonged to Saurashtra as they chipped with wickets on a day of attritional cricket. The defending champions perhaps have a different game plan and are trying to occupy the crease as much as possible. They were in a precarious 139/6 – Akshay Wadkar (45) and Akshay Karnewar (31*) put together their only fifty run partnership. Saurashtra lost the toss but kept the hosts under tight leash – the pitch could aid spinners more but the present score does not appear challenging. Jayadev Unadkat took two including Wasim Jaffer. The runrate of 2.22 is not exactly an advertisement for the game. Faiz Fazal is the captain of Vidarbha. Karnewar & AA Wakhare are at the crease with Umesh Yadav and RN Gurbani to come. At Seddon Park, life was different. Kiwis bowled first, ripped through India, and then cruised to an eight-wicket victory. No, this is not a recount of the Black Caps' performance – it's the strategy employed by the White Ferns, who had a dominant win at Hamilton. Much like the Black Caps, the White Ferns saved their best cricket until the series had been clinched by India, but dead rubber or not, their victory will be a significant boost to their confidence after what had been a disappointing last few months. The victory was led by the bowlers. Finally, the dangerwoman from the first two games - Smriti Mandhana – went cheaply, dismissed for one in the fourth over, while young star Jemimah Rodrigues and legendary captain Mithali Raj – in her 200th ODI did not make any great mark for once. At Napier, this morning, India woke up to another shock - Black Caps had India on the ropes. The ball was swinging, India were rattled, and a repeat of Thursday's drubbing was on the cards. Then, India found a second wind, counter-attacked, and delivered the knockout blow ! An inspired 10 overs of swing bowling from Matt Henry and Trent Boult reduced India to 18-4. The combined 23,401 ODI runs of Rohit Sharma, Shikhar Dhawan and MS Dhoni were all back in the pavilion, and the talents of 19-year-old Shubman Gill had been negated. But, after Henry and Boult came out of the attack, the Black Caps lost their edge. Partnerships formed. Boundaries flowed. And suddenly, India had reached 252 – a total good enough for their bowlers, who stopped the Black Caps 35 runs shy, and sealed a 4-1 series win. Ross Taylor departed fourth ball, trapped lbw by Hardik Pandya. 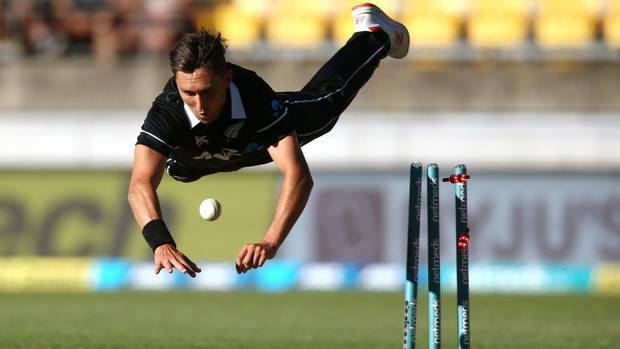 As it turned out, he wasn't out – the ball would have gone over the stumps, but he decided not to review, leaving another rebuild for Kane Williamson to lead. Score card reads : India 252 (Rayudu 90, Pandya 45, Shankar 45, Henry 4-35, Boult 3-39) beat New Zealand 217 (Neesham 44, Chahal 3-41) by 35 runs. Was that a test ? ~ one is not sure – for knowing fully well that it was moist Wellington surface, India chose to bat – lost wickets in a jiffy and soon were 18 fo 4 with Rohit, Dhawan, Gill & Dhoni back .. then came the partnership between Rayadu and Vijay Shankar, who was unfortunately to be run out to a wrong call by Rayudu. Under pressure, Ambati Rayudu led the revival with a 90 that featured sparkling stroke-play after an early struggle. Two allrounders played their part with 45s, Vijay Shankar off 64 balls to help rescue India and Hardik Pandya off 22 at the death. Pandya was really a treat to watch with a couple of savage attacks and some clean hits cruised to a cameo. Vijay Shankar, had an extra opportunity and used it well with a well made knock of 45 and a good partnership under pressure. At a time when Rayudu struggled, Vijayshankar made runs. Rayudu was 44 off 81 when Shankar was run out in the 32nd over, but capitalized the sacrifice of Shankar. Hardik Pandya first ruined Todd Astle's figures after he had done a stupendous job bowling at the death. Before Pandya hit a hat-trick of sixes - the fifth time in his international career - Astle had bowled cleverly and conceded just 17 in 4.1 overs. Pandya, though, unleashed mayhem, hitting five sixes and two fours in all to give India the big finish. Mohammad Shami bowled well and gave the right start. There was a time, when it appeared that NZ were in with a chance. Then came the drama, Kedar Jadhav appealed for lbw against Neesham, it appeared to be clearly outside the line of off. Neesham, who was connecting well in 44 off 31 until then, ambled out of the crease when the ball had hardly gone out of Dhoni's reach. Dhoni never lost sight of the ball as he appealed. The ever alert Dhoni took two quiet steps towards it even as he appealed. And then he ran Neesham out. What do you call that ? ~ a brain fade !! Happy that India again performed as a team – their bowlers, Shami, Pandya and Chahal ensuring tight leash and another Indian win – a 4-1 series win is certainly something to feel proud of.